USGBC Blog: Is a Sustainable City a Just City? Is a Sustainable City a Just City? In order to accommodate the expected increase in urban population of two billion people by 2030, we would need 200 new cities with populations of 10 million people—think 200 cities larger than Paris! Obviously the sustainable planning and construction of these cities is crucial to avoiding exponential increases in future emissions; however, accommodating two billion additional people will have wider implications than just on the environment. We need to address the livelihoods of the urban migrants themselves. 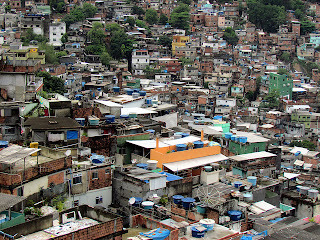 Rocinha Favela, the largest favela in Rio de Janiero. In rapidly urbanizing areas of the world, city migrants often construct informal settlements, many of which fall short of basic health and safety needs. No matter the name—informal settlement, slum or favela—these dwellings are holding people back from realizing the economic and social potential of the city. In a just city, people are connected to opportunities, either by proximity or by access to transportation. Yet today, many informal settlements and their occupants are marginalized by society and are forced to operate through informal economic transactions. Luis Urbiña, president of the Ford Foundation, explained that in order to improve the quality of life of new urban migrants, we need to formalize their existence through addressing citizenship, land rights and more planning. According to Urbiña, this formalization would allow dwellers to set up permanent economic and employment foundations, such as shops and services, allowing the community to gain new prosperity. Additionally, government planning around these communities would bring schools and access to transportation, giving them the tools to improve their own livelihoods and making them more self-sufficient. Urbiña’s overall message was that we should no longer think of low-income migrants as a problem. Rather, we should identify an opportunity for improvement. Society and governments must formalize and acknowledge the existence of these groups for them to become self-reliant. The issue of a sustainable and just city is an important theme for the Rio+20 Conference, as country delegates and civil society fights for the future we want. The Ford Foundation hosted a side event on June 18, “The Sustainable and Just City,” which convened experts from around the world on sustainable and just cities. To learn more about the Ford Foundation’s work on this topic, visit their website. Stand Up and Cheer, the EBies are Here!